One of the most pleasant, humbling, and slightly eerie experiences connected with the production of my play “Bombers” this summer at the 4th Line Theatre was meeting veterans who had flown in bomber command during WW II. Pleasant because we have something in common, humbling because they actually did what I had written about, and eerie because I watched the imaginary navigator from the play talking to the real navigator who had served in World War II. Fact and fiction meeting face to face. Very cool and slightly eerie. Today there are very few WW II vets still alive. All are in their nineties. Harry Hepburn, who served as a navigator in 6 Group Thunderbird Squadron (the actual squadron featured in the play) was one of them. He saw the final performance with his grandson, Major Christopher Hepburn who is currently serving in the Canadian Air Force and his wife who served as a nurse in Afghanistan. Humble times three. Harry loved the play and his grandson reported he had been singing along with all the tunes he recognized. Mission accomplished. No lives lost. When I started my research, over thirty years ago, most air crew vets were in there mid-sixties and I had no trouble finding them. I remember Jerry Fremlin vividly. He has passed on now but at the time he was living in Clinton, was married to the author Alice Munro and was a great story teller. I have our conversation recorded on an old cassette. “What do you want to know?”, he asked. “Anything”, I replied. I was so green. Thirty years, and ten thousand historical pages later I would be able to correct air crew on small details but not then. Jerry told me that VE Day (Victory in Europe) was “the worst day of my life”. He meant that “the party” was over. I learned from him that everyone’s war was different and some people’s war was fun. Jack Ackerman (retired) with a model of a Halifax bomber donated to him by a grateful audience member. Two days ago, Derek Scott and I had an afternoon beer with Jack Ackerman. 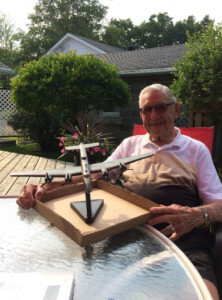 Jack is 94 and still plays golf but during the war he flew mid-upper gunner in a Halifax. 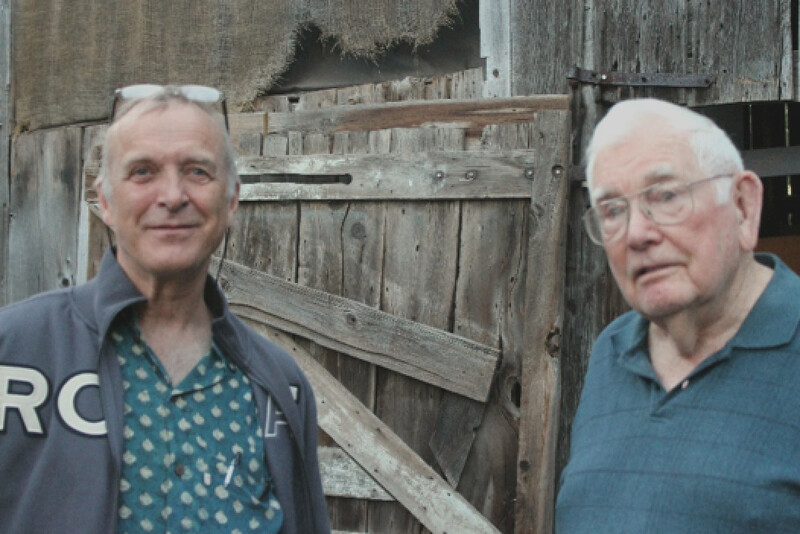 He shipped over to England with Stu Laird, the man who inspired the play, although they never met on the boat or in England, until many years later when they were both living in and near Perth, ON. Jack remembered the mission when four bombers from his squadron went out to lay mines and only his plane returned. A loss like that, 21 men, would have been devastating on a small, tight knit squadron not to mention on Jack and his crew. In the dark humour category, he told the story of the time the nose of his plane was sheared off, along with one of the bomb aimers fingers, by falling bombs from ‘friendly’ planes above. This was a situation that was common and I had made it a dramatic incident in the play but Jack’s story of returning to base and then, with wild abandon, tossing incendiary bombs out of his damaged plane was a memory that he, and now I, will never forget. Jack finished his 34 missions before he was twenty-one. We sent children but I guess in 1940 we didn’t think they were children… and neither did they. Thank you for your service gentlemen. We are all better for it. And we have not had a first power to first power war since then. May the peace, already a record, last long.